"Do not give what is holy to dogs, and do not throw your pearls before swine"
"i have provided hundreds of pages of irrefutable evidence and knowledge of the Devi. i have also strongly cautioned against the avidya that the devotees of Her incarnation, Shri Mataji Nirmala Devi, are indulging in, and encouraging/enforcing others to do the same. Seeking such knowledge of the Devi—while strictly avoiding/ rejecting such avidya at all times—alone makes life worthwhile, and the attainment of knowledge completely fulfills the ultimate purpose of existence. Such knowledge is far more priceless than Silence, and precedes it. Without such knowledge you cannot comprehend, far less learn how to maintain, Silence on Self. The Devi insists that liberating knowledge can be attained here in this world. There is nothing to surrender to Her except our ignorance and arrogance." > saints glory in its praise." > Motilal Banarsidass Publishers, Delhi, 1997 p. 4. > they were possessed by evil spirits. > Yoga Subtle System Religion). Specifically, we follow Jesus' words, repeated often in the gospels, about the need to wake up and to remain awake. When we join this injunction with the one about the Kingdom of God being within, the implication is that going within requires a person to wake up, also. In fact, that's the only way to live any spiritual path to the fullest. The traditional ways of devotion, service, and contemplation don't actually solve the problem of Jesus's contradiction between inner and outer life. Tolstoy was right: If you take Jesus at his word, your life must be realigned completely, away from worldly ways towards godly ones. Because he is so absolute, Jesus doesn't offer a path of devotion that consists of daily prayer and piety to God. He wants total, unswerving devotion. You shall love the Lord your God with all your heart, and with all your soul, and with all your mind. In other words, every thought must be of god and every action directed towards him. Such a teaching is unworkable except for the most pious of recluses. The same holds true for the complete selflessness required on the path of service and the total fixation on spirituality required on the path of contemplation. But denying the world is a path to extinction, which no one can advocate. Nor can we assume that Jesus wanted us to annihilate our egos and personalities in the name of God. It's more reasonable to assume that reaching Heaven requires an unfolding process. If you were able to meet Jesus today as he was in real life, there would be a gap between your level of awareness and his—we know that this is true when we encounter spiritually inspired people who are far less enlightened than Jesus, the saintly among us whose compassion reflects back our own spiritual shortcomings. If you were to follow Jesus after meeting him, you would have to close this gap, setting you on a path that unfolds over time. The same holds true without a flesh-and-blood Jesus; the same gap needs to be closed between your present state of awareness and God-consciousness. Devotion, service and contemplation remain viable ways to transform yourself, yet even the most devout Christians fall into the trap of believing that they don't have to transform themselves inwardly, that performing enough acts of devotion (attending church, praying, giving to the poor, and the like) will suffice or that doing charitable work among the poor and sick, or thinking about God as often as possible, will be sufficient. Jesus warns us against this trap when he speaks, in parable form, about seed that falls on waste ground and doesn't sprout. The seed is his teaching; the waste ground is the mind unprepared to receive the truth. Jesus's vision was so breathtaking that it inspired a new religion, but without the lens of higher consciousness, these teachings seem to be mere fantasy, a distant hope that will be fulfilled, if ever, only in Heaven. Christians want to feel that their religion is unique, which is certainly achieved by claiming the one and only Son of God. But by the same token, they risk being left out of the great human project, which began centuries before Christ and continues to this day. This is the project of transcending the physical world to reach the realm of the soul." > physical world to reach the realm of the soul." Today i feel so relieved that i did not participate in subtle system SYs shoe-beating Deepak Chopra, who is in their black book of false gurus. Despite being new to Sahaja Yoga i did not follow this herd mentality that is typical of most SY collectives. Few SYs have the independence of judgment to think for themselves. If a SY throws the negativity of, say, Deepak Chopra's existence into the havan, the rest just follow and bleat his despicable name like sheep. Countless SY havans have been initiated over the decades to rid the world of all types of negativity, including Deepak Chopra. My seven years in the SY collectives were the worst years of my life and that of my family, and till today we still shudder at some of our experiences. But the Devi that my children kept daily meeting between 1993-2007 more than compensated for all the abuse, and will be so for the rest of our lives. i did not ask the Adi Shakti about Deepak Chopra because in my heart i knew he was a very special person. His books intrigued and inspired me, and expanded my comprehension of consciousness, spirituality and the Divine Mother. That was in the 1990's. Today we have his masterpiece, "The Third Jesus: The Christ We Cannot Ignore". It has helped me a great deal to support the message of the Comforter and Her teachings as well. But for the majority of subtle system SYs he remains a false guru, an outcast writer to be shunned at all times. Such is their poverty. Deepak Chopra has done far more to uphold and promote Jesus than the entire SY organization combined ......... for the last three decades. i am willing to chisel this truth in stone. As a firm believer of all religions, prophets and Holy Scriptures i find these words of Deepak Chopra so harmonious, enlightening and comforting. "Christians want to feel that their religion is unique, which is certainly achieved by claiming the one and only Son of God. But by the same token, they risk being left out of the great human project, which began centuries before Christ and continues to this day. This is the project of transcending the physical world to reach the realm of the soul." Yes, the sending of the Comforter, Shri Mataji, is the continuation of "the project of transcending the physical world to reach the realm of the soul." For those of us taking part in the Resurrection we know it is the culmination of the great human project; the collective and harmonious triumph of all religions, prophets and Holy Scriptures; the promised Blossom Time to evolve into the eternal spirit! "This is the project of transcending the physical world to reach the realm of the soul." the heart and soul of all religions, prophets and Holy Scriptures? 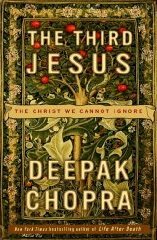 And we should all remember that Deepak Chopra was never a SY, but yet exalted Jesus before the world. So who are these anti-Christ elements in SY organization who have always condemned Deepak as a false guru? And why do they refuse to uphold the Saviour, the Comforter and Her message of the Resurrection? Why and how has this anti-Christ negativity penetrated and firmly entrenched itself in the SY Church today, just as it did when the Catholic Church established itself? And who promotes Lord Jesus more - the SY or Catholic Church? i recall the shoe-beating session quite well because so many types of baddies were beaten by SYs. Before each baddie was punished his or her crime(s) were read out loud and clear. So as a honored juror of such an esteemed kangaroo court (and i don't mean Australia) i had to quickly judge the seriousness of the crime and calculate the number of shoebeats with my size 12 shoes as fit punishment. i remember whacking the daylights out of corrupt lawyers, politicians, doctors, dentists, IRS (Internal Revenue Service) and, of course, false gurus. i subsequently asked SYs the reason for shoebeating when there are better alternatives. Why shoebeat a man beating his disobedient dog when it is more effective to approach and reprimand him? i always believed shoebeating was a primitive club for those unable to understand more subtle ways like being thoughtless or paying attention or surrendering entire problem to Her. Now we have evidence that Shri Mataji's original aim was for certain SYs to shoebeat their own egos, another corruption of Her teachings that over the years degenerated into a collective court to try and judge the guilty. i said "guilty" because all brought before this collective court ARE GUILTY. It is only the punishment that needs to be meted out by the judge, jury and executioner. So when it came to Deepak Chopra's turn he was read, in absentia, a list of his crimes. The SYogini was quite angry that he had copied SY techniques and was regularly seen laughing all the way to his bank. This SYogini was so pissed that she and other SYs were making plans to petition Shri Mataji that this intellectual bandit was robbing Her in broad daylight. Since Shri Mataji was not aware despite being the Adi Shakti, these SYs were going to draw up a list of items stolen from Sahaja Yoga. They wanted to enlighten Shri Mataji of such an infamous thief of truth, as well as remind that She is seriously lacking vigilance. There were no specifics Chandra, just a vague accusation that Deepak Chopra was not only robbing Sahaja Yoga of intellectual property but souls as well, souls which could be better served and saved by subtle system SYs. But i refused to shoebeat because it was such a ridiculous accusation. i admire Deepak Chopra for his academic background, his field of expertise, clarity of communication and impeccable as well as exquisitely precise English. He can easily qualify as the Queen's Council for spiritual law and defend the Divine. Only fools will accuse him of stealing spiritual property. But then who am i to challenge their wisdom and vibrations? > Puja, June 18 - 20, 1999 at Canajoharie, New York. > Truth. i never found any resemblance to Sahaja Yoga." I would like to pick up on your puzzlement over how Deepak Chopra has copied Sahaja Yoga and its techniques. Have you ever asked the Sahaja Yogis who had spread the allegation to specify exactly how and in what way Deepak Chopra had infringed SY copyrights, as it were? Even if you have done that, my bet is that nobody was able to give you a satisfactory answer although everybody would tell you that Deepak Chopra is a baddie who has cheated Sahaja Yoga by copying SY's copyrighted techniques. In other words Sahaja Yogis regard Deepak Chopra as a crook based on the vague notion that he has plagiarized Sahaja Yoga even though nobody can say exactly how. Although we Sahaja Yogis regard ourselves as "enlightened" people it is indeed ironical that we can tolerate and even participate in this kind of calumny and slander. I shall now cut to the chase, so to speak. Deepak Chopra published several motivational books in the nineties, probably the same ones you used to browse in the stores. In one of the books he introduced a system of meditation which he called "mindfullness." He explained this type of meditation by referring to the gap between two thoughts where one experiences thoughtless awareness. His system of meditation teaches the meditator to expand this area of thoughtless awareness. Sounds familiar? Of course this is also what Sahaja Yoga teaches. But this hardly makes Deepak Chopra a copycat. As I quoted in my previous post, no. 8219, and extracted above, this idea of the gap between two thoughts is ancient scriptural knowledge. But no matter. The cry went out: Deepak Chopra was copying Sahaja Yoga and its techniques! There is every likelihood that Deepak Chopra had never heard of Sahaja Yoga much less copied its techniques. If anyone approaches him to tell him about his purported plagiarism he would probably respond with a LOL (laughing out loud). If he is in a less amiable mood there is a wide selection of more rude and insulting Internet abbreviations for him to choose from. The joke is really on us Sahaja Yogis. If we practise Sahaja Yoga like ignoramuses, totally unaware and unmindful of our scriptural antecedents this is the kind of morass we will fall into, a folly of our own making. What we need is real awareness and indeed, mindfullness. Coming to think of it, many of our Sahaja Yogis could well benefit from Deepak Chopra's mindfullness meditation. LOL.